Elf is a favorite Christmas movie for my family, so we quote it a lot. Around the holidays, because my twin sister is a baker, we often acknowledge the elves’ four main food groups, candy, candy canes, candy corn, and syrup, because our diets mostly consist of sugar. 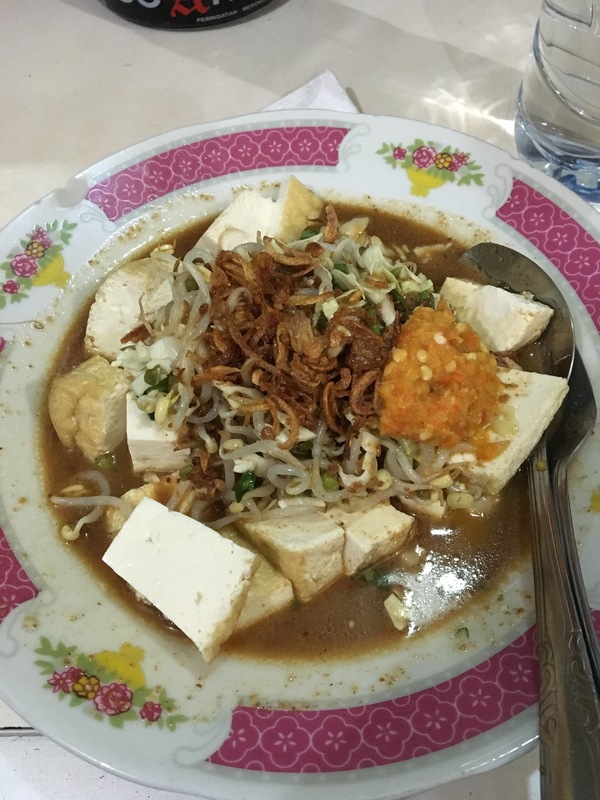 In honor of the movie, I thought I’d mention what I’ve observed as the four main foods for Indonesians, and then the four foods that make up a large part of my diet. 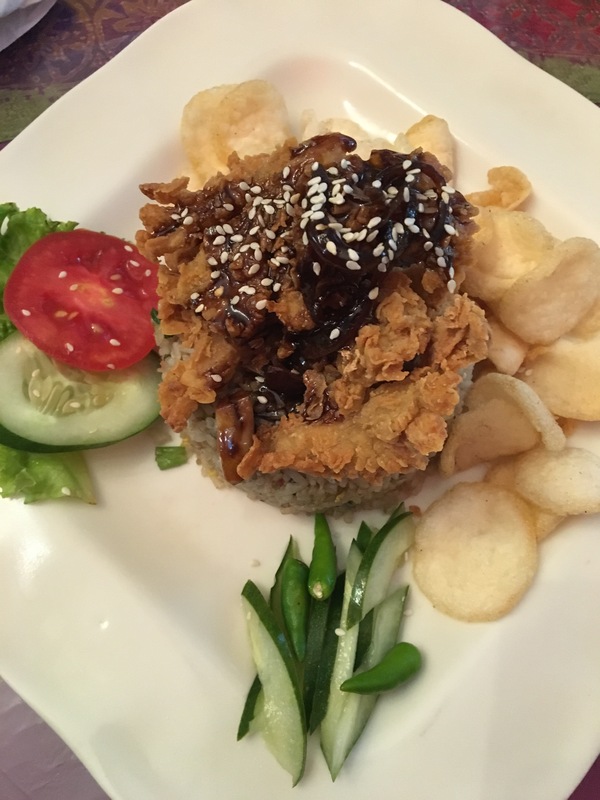 Rice or “nasi” is the most important food in Indonesia. 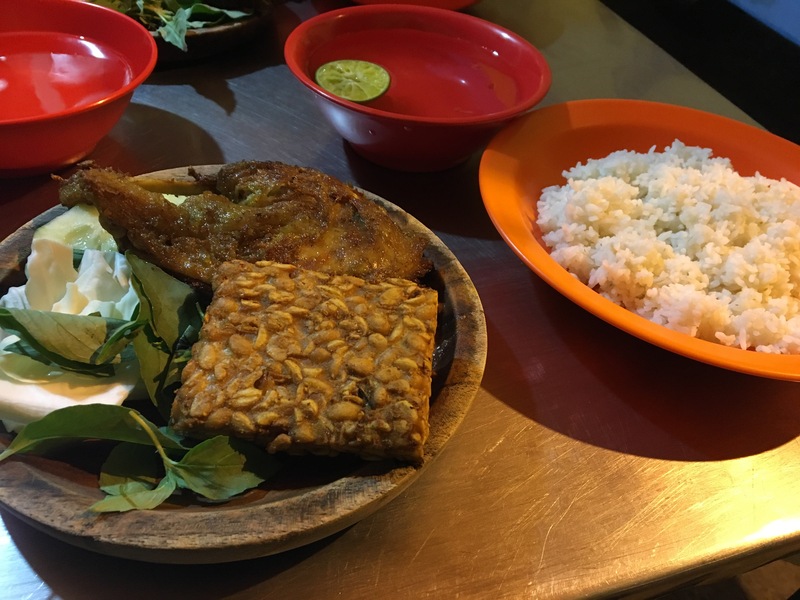 I cannot count the number of times I’ve heard someone say, “it is not meal without rice.” Indonesians eat rice three times a day, breakfast, lunch, and dinner. 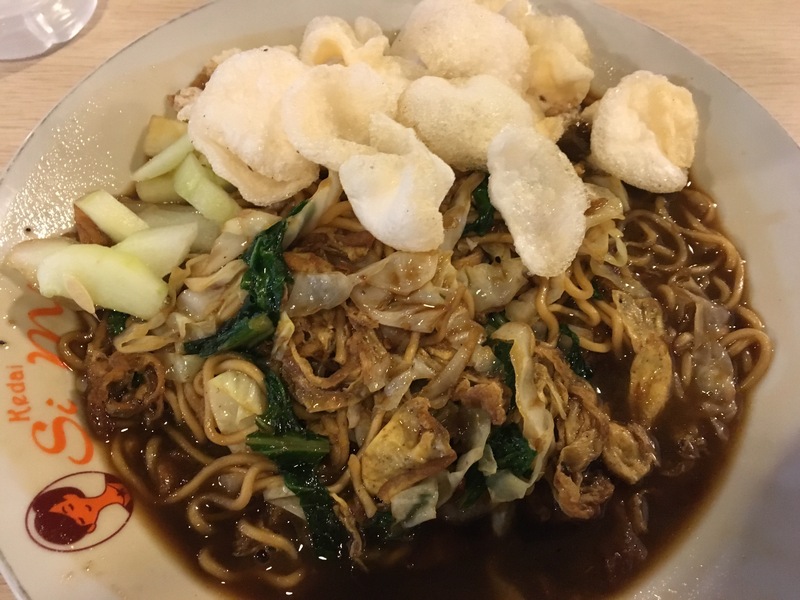 Even if I eat what I consider a meal with noodles, meat, and vegetables, if there’s not rice with it, my Indonesian friends or coworkers will say it is not a real meal, but rather a snack. Rice is considered the food of Indonesia, and I cannot stress this enough. Even McDonald’s sells most of its entrées with rice. Of course, there are different kinds of rice, including fried rice (nasi goreng), white rice (nasi putih), and yellow rice (nasi kuning) to name a few. 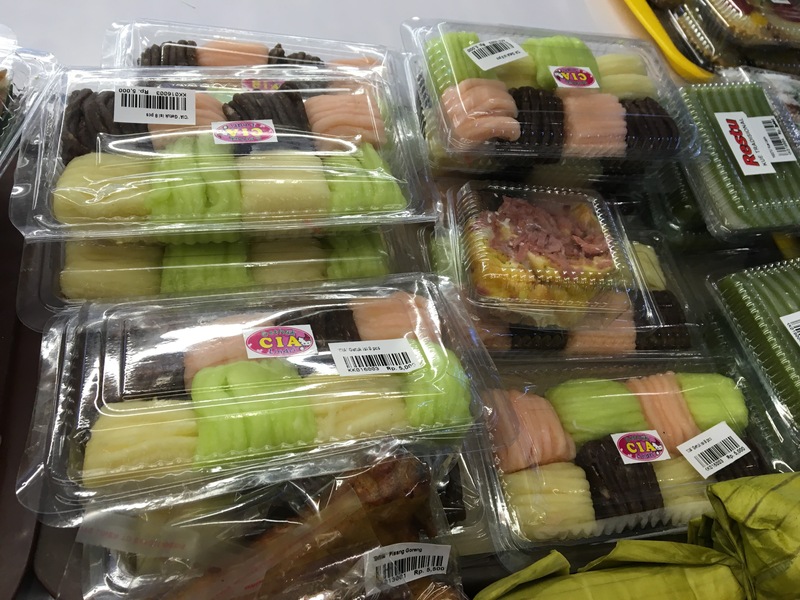 There are a bunch of different foods that are made out of sticky rice. A favorite is arem-arem, which is sticky rice, with spicy chicken inside, and all wrapped in a banana leaf. Most meals include chicken or beef in some form. Grilled or fried chicken is especially common. Fish, shrimp, squid, and other kinds of seafood are easy to find as well. At both fancy and roadside places, it is possible to get a fish cooked, grilled, and given to you whole. It can be hard to find pork in Indonesia since it is not considered halal*. 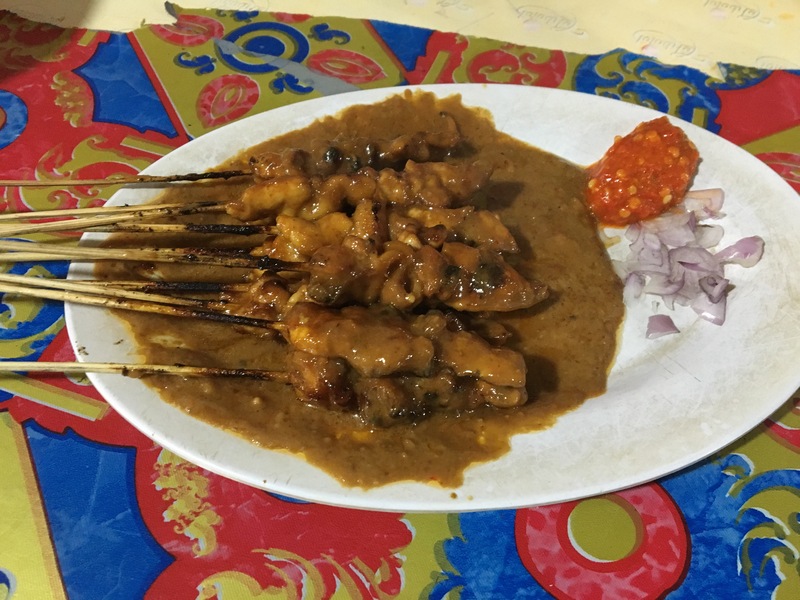 I’ve found pork on a menu once in Java and it was extremely expensive. It’s the tropics, so there’s a lot of tropical fruit: mango, coconut, jack fruit, banana, and more. There are lots of places where you can get juices and smoothies. It is really easy to find places that sell whole coconuts and a straw, so you can drink the fresh coconut milk and eat the meat inside. 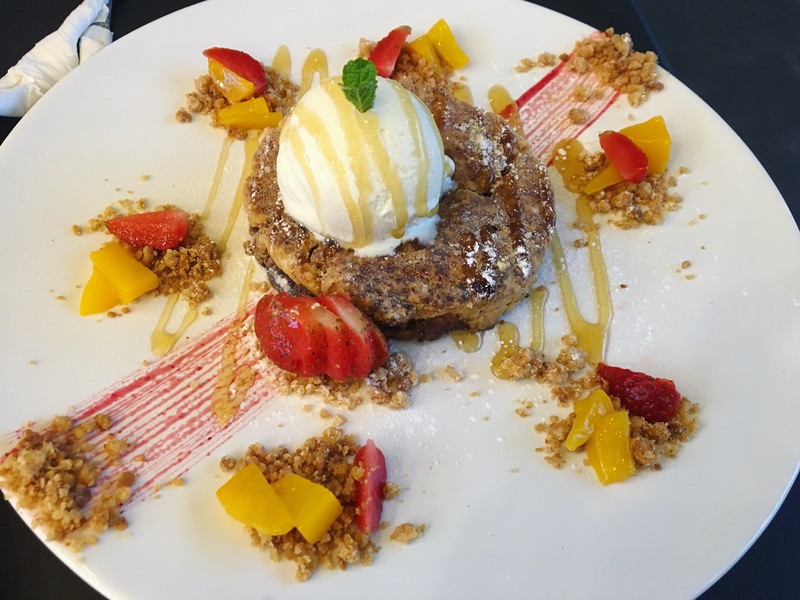 Malang is known for its apples, so apple pie (pictured) and apple strudel are easy to find…and delicious! Cassava, which is available in the States and similar to a potato, is used in a lot of food. It can be eaten cooked or fried. Or it can be made into a semi-sweet snack food that sort of has the consistency of dough (hard to explain but tastes good). My favorite is cake or “kue” that is made out of cassava and has a buttery/sugary icing and cheese “keju” on it. Kerupuk is airy/light cracker, which usually has a slight fish or shrimp taste. Most meals include kerupuk on the side (with rice, of course). Everything is and can be fried in Indonesia: chicken, cassava, vegetables, tofu, etc. I eat a lot more fried food here than I did in the States… and I love it. I eat a lot of peanut butter. While it’s easy to find, it’s expensive relative to other Indonesian food prices. 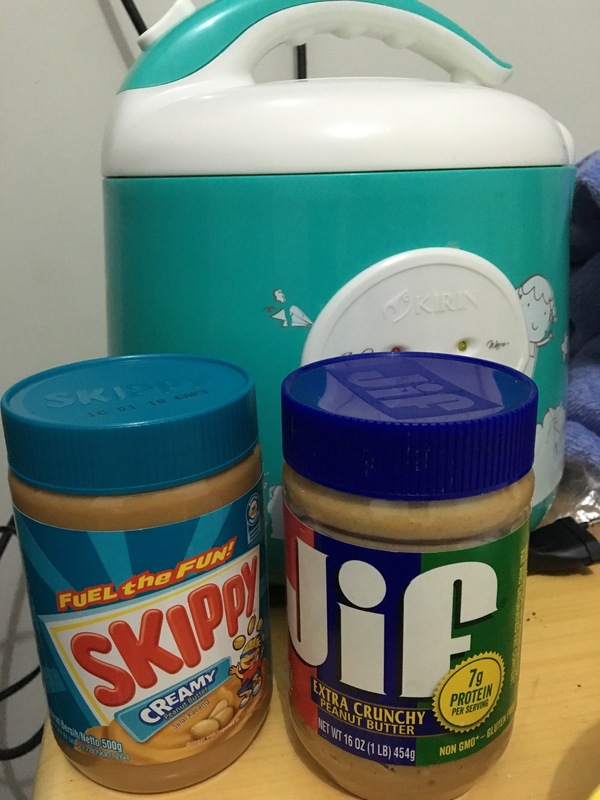 However, I’ve found pretty much every brand of peanut butter I would eat in the States including Skippy, JIF, and Peter Pan. I don’t have a lot of room to cook in my kost, and I really dislike cleaning dishes, so I make a lot of rice cooker oatmeal. But fortunately I can add honey and peanut butter or brown sugar and banana to spice it up. By default, I eat a lot more rice here than I ever did in the States. At least once a day. But (not yet) three times a day. Noodles “mie” are as readily available and tasty as rice! Convenient stores are almost ubiquitous. The two most common ones, Indomaret and Alfamart, carry essentially all the same products. 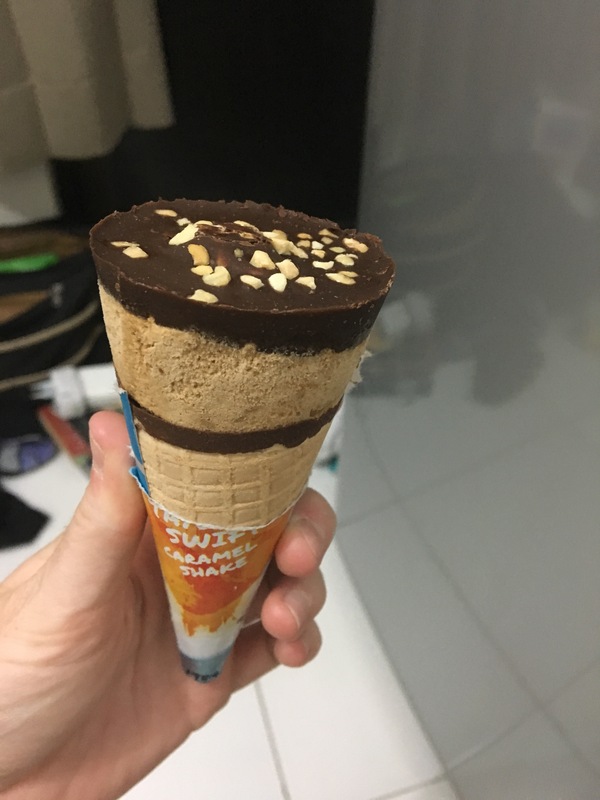 Most importantly, they have packaged ice cream cups and cones. I love these and buy them all the time. By Indonesian standards, western food equals pizza, pasta, and hamburgers. So I actually eat pizza fairly frequently! And, for better or worse, Pizza Hut pizza tastes almost exactly the same here as it does in the States! 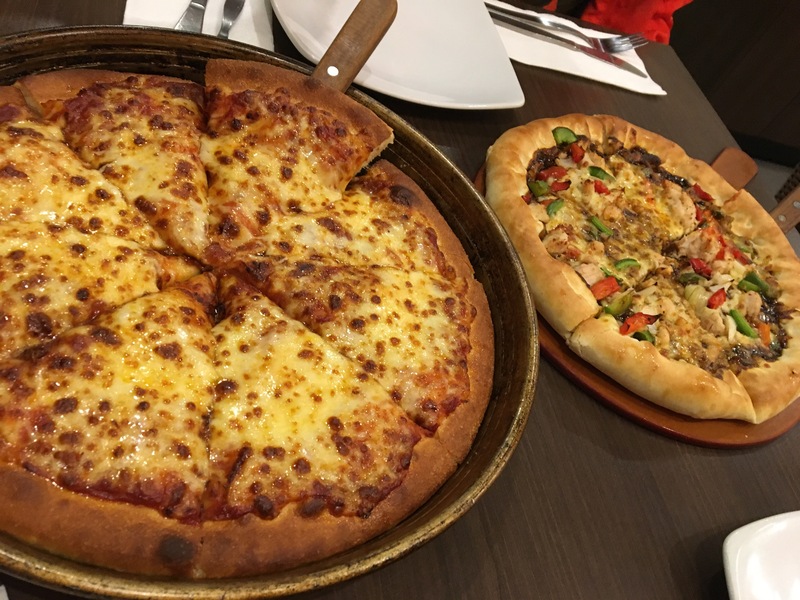 Pizza Hut’s delicious and cheesy cheese and veggie pizzas! You may have noticed vegetables and dairy products such as yogurt and milk are largely absent from this list. And yes, while I can get cooked vegetables in dishes or buy yogurt at the grocery store, the complexity of foods in my diet has taken a hit, especially due to what raw vegetables my Western stomach can (or rather can’t) handle. 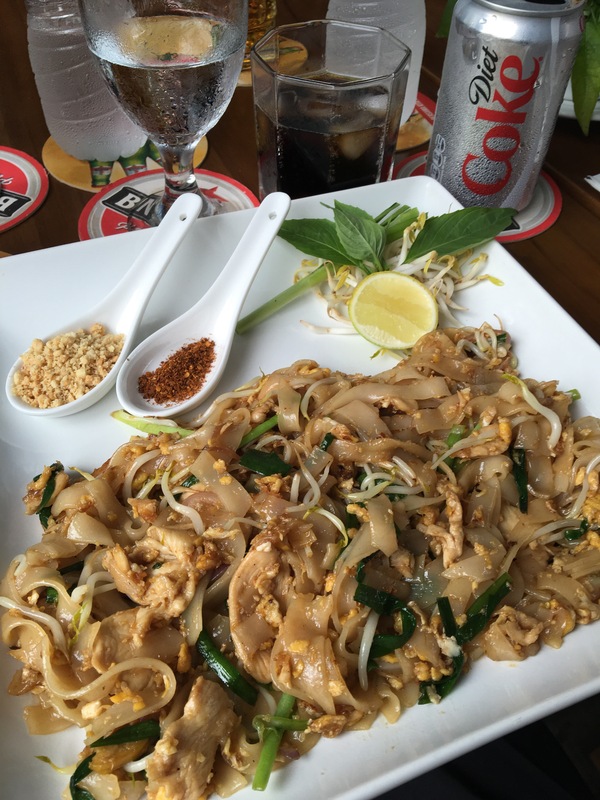 Fortunately, traveling has provided opportunities to find all kinds of food from all over the world. 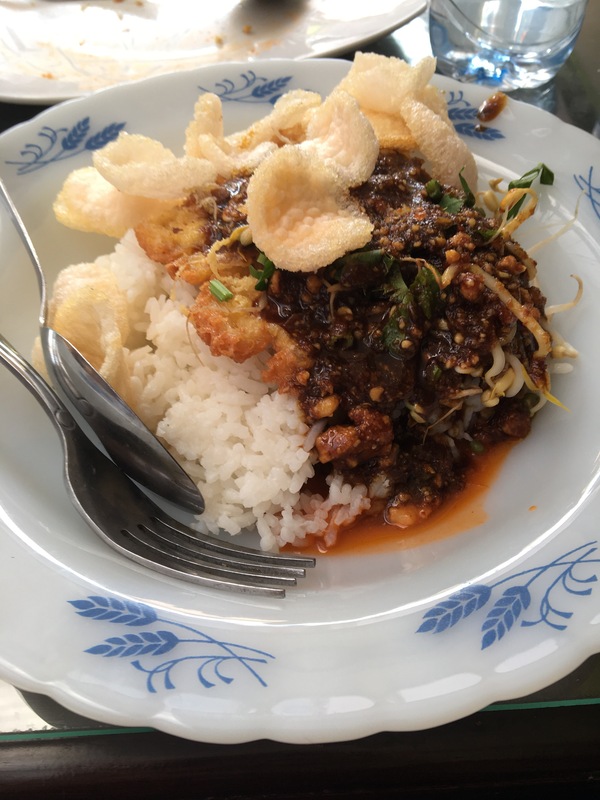 While this probably isn’t my last post about food, I do want to say Indonesian food is delicious! I’m already certain that finding an Indonesian restaurant will be on my short list of things to do when I return to the States. 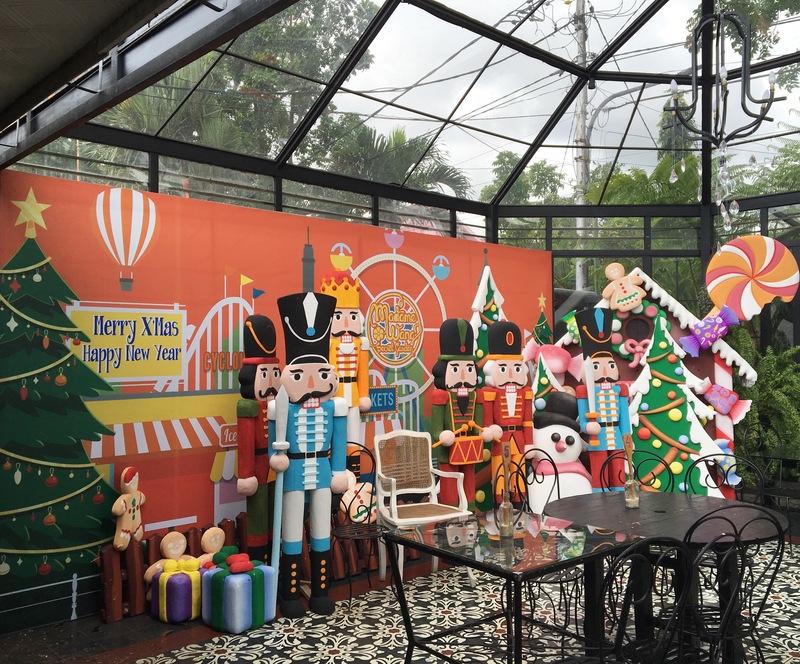 And also, Merry Christmas and Happy New Year!! *Halal means what is permitted or allowed by Muslim standards. Halal dictates how food is prepared and where it is prepared, so not only does the food need to be halal, but the place in which it is prepared must also be halal.